A groomsman may be your brother, college roommate, cousin, or coworker. No matter the official title, they are important relationships in your life. They threw you that raucous bachelor party, went with you to your tuxedo fitting, and offered support on your big day. How will you show your appreciation in return? We have different personalized groomsmen gifts to fit all of the personalities of the men who you chose to stand beside you on your big day. Everyone has a friend that is the life of the party and is typically the mastermind behind some of your most memorable stories. For this friend, our 1.25 oz Personalized Glass Mug Shooter is the perfect gift. Its fun and unique shape makes it different than other shot glasses that may be in his cabinet, and with the option to engrave it with his name, initials, or a fun image, we promise that it will become his favorite. Do you have an avid outdoorsman in your wedding party? Consider getting him a personalized hunting knife. The Rosewood handle enhances the appeal of this useful tool. You can choose to have it engraved with a special message commemorating a wedding event. flat base, it is perfect for any beverage. Then, every time he is muddling a cherry for his old fashioned or sipping whiskey on the rocks, you know he will be thinking of you. A golf trip is a great way to spend a bachelor weekend. Or, if your groomsmen are golfing enthusiasts, they will love our Personalized Golf Tee and Marker Set. 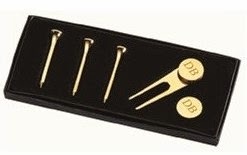 With three tees, a divot tool, and two pop off ball markers, anyone would be proud to carry this set in their golf bag. We recommend engraving with a monogram or initials for the small area, but could also engrave a small inscription upon request! Stumped for which glassware is right for your groomsmen? Not sure if you want to order different styles for every guy? The Personalized Beer Sport Mug is a gift that everyone will love equally. Thick and sturdy with a strong pedestal base and handle, it holds a generous 16 oz of your favorite microbrew. As the largest item on our groomsmen gift list, you have even more room to engrave a personal message to each friend. Open them together at your bachelor party and cheers to the future ahead, and then they can be enjoyed for years to come during any Sunday football game. No matter what gift you give, it makes your big day all the more special to know that you have your groomsmen there with you. Show your gratitude for their years of support and friendship with one of our creative groomsmen gift ideas that shows them that you really know their likes and tastes. Any purchase comes with free engraving, and orders of $99 or more will ship for free! Yeah it is hard to decide on groomsmen gifts but you have made this job very easy for many grooms. Keep sharing such posts. At the destination NYC wedding venues my brother will get married so I am definitely going to share these gift ideas with him. I am sure he would like these.